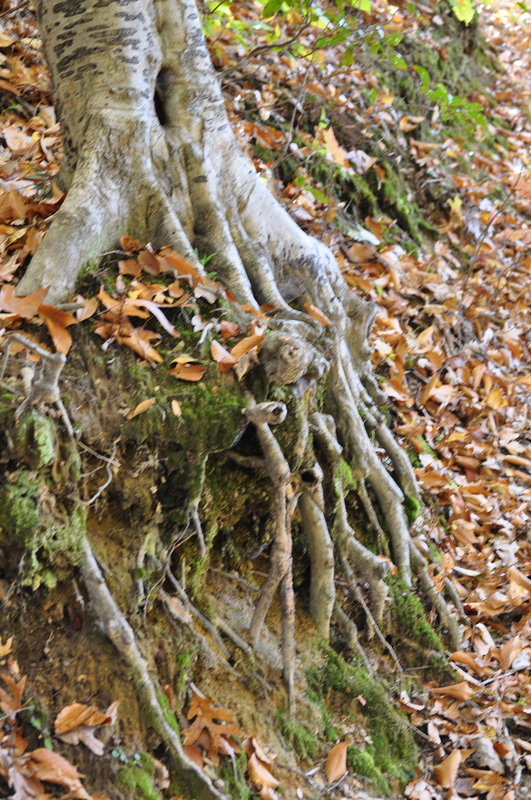 On Holy Saturday, the Photo-a-Day prompt was the word “roots.” At first I was taken aback. Nothing about the tomb? The silence? The disciples, scattered, afraid, confused, grieving, and alone? Then Rachel Hackbarth’s prompt for my daily Lenten prayer writing appeared in my mailbox. Did Jesus really say that it was better for Judas (or anyone one of us sinners, really) to have not been born? Such a denial of life from the One who spent his ministry affirming life shocks the soul … and yet, oddly, I find that it suits our Holy Saturday reflection, because surely the disciples experienced a traumatic denial of what their lives had been about when Jesus died. After he was buried, did they wonder whether it would have been better to never have known Jesus? In your prayer-writing today, consider the sudden vacuum to life — the loss of purpose and hope — that the disciples felt, that you have experienced, that others struggle through. In these moments of traumatic upheaval, when down is up or sideways, or, somehow irrelevant, I flounder a little. I storm the heavens with my WHYs and WHAT NOWs. I beg for insight, direction, and clarity. I doubt my ability to even KNOW God. After all, when life seems to be in a shambles around my feet, I think that surely it must have been my fault. How could I have missed the signals? Was I really that far off-track? Without fail, God responds. Bringing peace and patience as I pick up the pieces of my dreams, plans and goals and put them back where they belong… in God’s Hands. With gentleness that only comes from God, I gain perspective. Many times, it is not my doing. It can be a crap-tastic confluence of the economy, political machinations and other people’s egos. It can be another person’s insecurities and self-preserving decisions. And it can also be that I wished a little too hard for something to come that was never intended. I wrestle with abandoning all attempts to re-start, and becoming a cynical, angry bon-bon eater. (Since I’m really not a big bon-bon eater, that doesn’t fit the bill!) Or I go on a fiendish cleaning and purging spree, tackling closets, bookshelves and storage shelves. Other than helping us hoard less, that doesn’t do much good, either. Sometimes I retreat. I want a safe space where I don’t have to try any more. But withdrawing doesn’t do much, other than make the echoes of my questions that much louder. No, I’m not called to a spiritual womb, but to my spiritual ROOTS. As I slowly stop spinning in circles, grasping at straws, God meets me in the center of my fears and disillusionment. I’m taken back to the basics of my faith, the Roots of my spiritual experience. I rediscover the places of joy, and hope, and healing. Journeying with God, like walking a labyrinth, I see the twists and turns of recent events. And I understand. It’s life. It’s not predictable. And it is completely in the realm of God’s control. In the dark hours of the tomb, the disciples did not know there was hope and joy around the corner. I know. I wait. I live with abandon and trust. I’m standing on the edge of Spring, waiting for leaves to unfurl and life to burst out of winter’s grasp. That is the promise of Holy Saturday. We know that the dead will rise, the grip of death and pain and loss will be broken. It brings me back to the Roots of my faith, the lineage of Hope given to me through my parents and grandparents and the Church Universal. My Roots give me the stamina, courage and purpose to press on in spite of some of the ways that my Call has been thwarted by others. My Roots bring nourishment to my growing edges, allow me the energy to push out branches and changes to the shape and spread of my ministry. My Roots are an anchor to the Truth (yes, capital “T”) in the Holy Scriptures, grounding me in the One who is the SAME.